The Rams go to Rotherham this weekend. The Rams hit the road on Saturday and head to the New York Stadium - not the one over the pond in the USA, but the home of Rotherham United in Yorkshire. This newish ground is actually quite close to their old Millmoor home and is a nice setting for football. It was built by the company owned by former Rams Chairman Peter Gadsby. The Millers are one of the teams promoted from last season's League One and will provide a decent test for our lads. Rotherham is a game that we will be hoping to come away from with three points in the bag, but obviously no games are bankers in this division. We have a run of games that look very winnable and it’s important that we take as many points as possible before we play the trickier looking matches. The form of Chelsea loanee Mason Mount isn’t going unnoticed by the press and he made this England Under-21 debut during the week and got his name on the scoresheet too. There’s no doubting the natural talent of the young player and no doubt he will be in the Blues' plans in the very near future. We are very lucky indeed to have him for the season. What has become apparent under Lampard’s management is that we aren’t going to be a one dimensional team. He has played both 4-3-3 and 4-2-3-1 formations, and he is as different to our last manager as its possible to be. What will be interesting is when the likes of Jack Marriott and Duane Holmes are getting regular game time. Both have natural ability and skill to impose themselves on games, but for the time being are having to be patient in their wait for playing time. 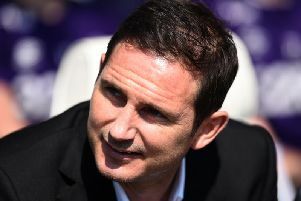 Their introduction as starters in the league may be when others are injured or when Lampard sees the need for a change in tactics. It is something of a luxury to have these players on the bench. Curtis Davies and Harry Wilson won't, it transpires, be fit to return on Saturday, thus eliminating a potential selection decision when it comes to their positions. Even had they been fit, I would have been inclined to leave Fikayo Tomori and Florian Jozefzoon in the starting eleven for the time being. I think both have done enough to justify their selection. It also gives Davies and Wilson extra time in making sure that they are 100 per cent. Let's hope that on Saturday tea time we are celebrating another three points and hold our place in the top six.